Based on the Marvel Comics character from World War II. A brave, yet mild-mannered young soldier named Steve Rogers, volunteers to undergo a series of experiments for a US army Super Soldier program. The military succeeds in transforming him into a human weapon, but quickly decide that their Super Soldier is far too expensive a creation to risk in combat. So, they decide to put him to use as an army celebrity and parade him across Europe to boost morale by performing in USO shows for American troops. He is even given a costume that bear the colors of Old Glory for the stage. Then, when a Nazi plot reveals itself Rogers must rise up and and become the First Avenger, in order to save his country. Steve Rogers becomes Captain America and he earns his way into the hearts and souls of every American, bringing hope and justice to a war-weary nation. 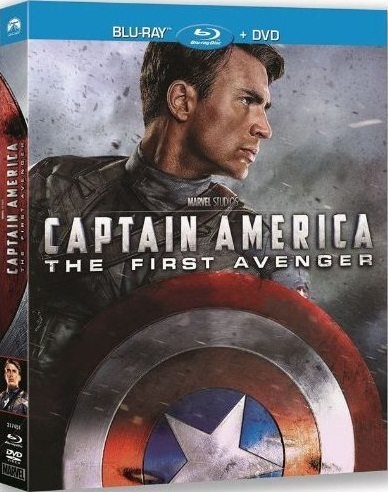 Later, during a mission to Germany to stop his archenemy - The Red Skull, from launching rockets at the allies, Captain America sacrifices himself and winds up frozen in ice for almost six decades! Revived, Steve Rogers now must join forces with new heroes and become an Avenger of the modern age.